Best Oven-Baked Baby Back Ribs and Rub are for you if you love baby back ribs but don’t love standing outside in the heat for several hours cooking them or don’t have a grill! 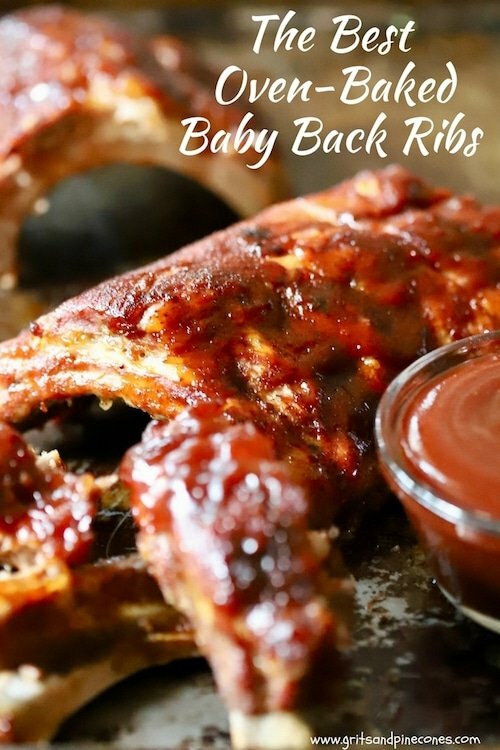 These oven-baked baby back ribs are mouthwateringly juicy, fall off the bone tender and when slathered with tangy barbecue sauce, just plain finger-lickin’ good! Folks in the South take their barbecue very seriously, and there are countless articles and reviews of different barbecue restaurants and barbecue contests to decide which barbecue is the best, but ultimately any selection is a highly personal and subjective matter. 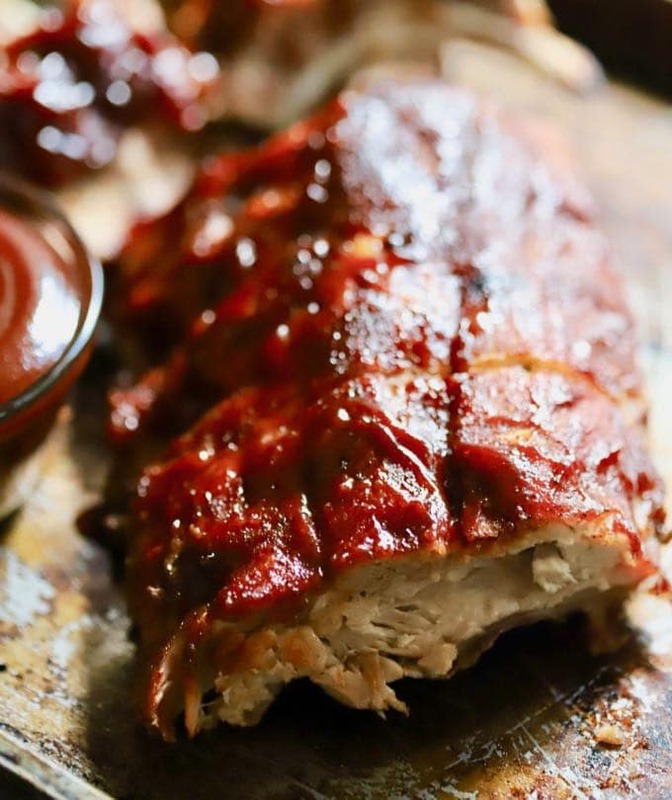 In other words, what is a killer barbecue sauce, baby back ribs rub, or baby back ribs recipe for one person is not necessarily another person’s favorite and the debate about the merits of wet vs dry baby back ribs goes on and on. Barbecue aficionados live, eat and breathe the stuff. There is even a Florida BBQ Association whose mission is to promote, through education, family-friendly fellowship, and competition the uniquely American tradition of barbecuing meat over natural wood or charcoal-fired heat and smoke. In case you are wondering, baby back ribs do not come from baby pigs! They are only called baby back ribs because they are shorter in comparison to regular spare ribs and St Louis style ribs. I think baby back pork ribs are the best ribs for grilling, but again everyone has their own preference. I’m not going to tell you that these baby back ribs in the oven will rival baby back ribs which are smoked low and slow for hours on a grill, but what I will tell you is that my son who is a barbecue snob pronounced them delicious and proceeded to devour a rack in one sitting. And, if you are one of those folks like him, well, you will just have to try this recipe to become a believer. The convenience of being able to cook baby back ribs in the oven instead of standing over a hot grill on a hot summer day wins every time in my book! Unfortunately, one thing that you don’t get with this baby back ribs recipe is the smokey barbecue flavor, but these oven baby back ribs are succulent and delicious in their own way. If you really can’t live without the smoky taste, you can always just add a small amount of liquid smoke, smoked paprika or smoked salt to the barbecue sauce or purchase barbecue sauce with a hickory smoke flavor. 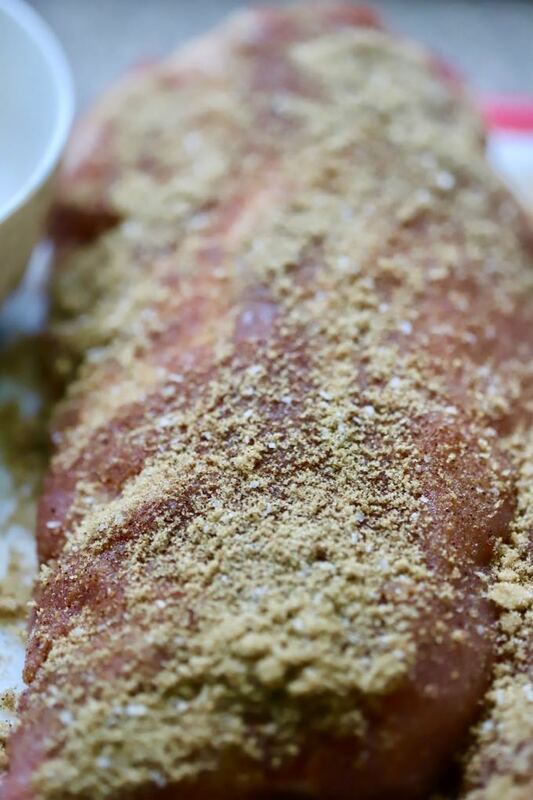 One other thing that sets this delicious oven cooked baby back ribs recipe apart is the tantalizing and spicy dry rub for baby back ribs or dry rub for ribs in the oven! This special baby back ribs dry rub lends just the right balance of sweet and spicy flavor and makes them ever so flavorful. Looking for sides to serve with your Baby Back Ribs? Check out these delicious options: Southern Potato Salad, Southern Style Baked Mac and Cheese, and Southern Fried Green Tomatoes. Need even more ideas, click here to see all of my side dish recipes. When you are ready to prepare the oven cooked baby back ribs, preheat the oven to 300 degrees F.
Remove the membrane from the back of the rack of baby back ribs. Use a small paring knife to pry up a corner of the membrane. Then, grab the membrane with a paper towel and peel it off down the length of the ribs. You can also ask your butcher to do this for you. How to make baby back ribs dry rub. To make the baby back ribs dry rub, combine all dry rub ingredients in a small bowl. Sprinkle the baby back ribs dry rub liberally all over the front and back of the ribs and gently rub it in. For the best flavor, let the ribs sit with the dry rub on them for at least 30 minutes. Or, you can refrigerate the ribs and let them sit for up to 24 hours. How long to cook baby back ribs in oven? When ready to cook the baby back ribs in the oven, wrap them in heavy-duty aluminum foil. 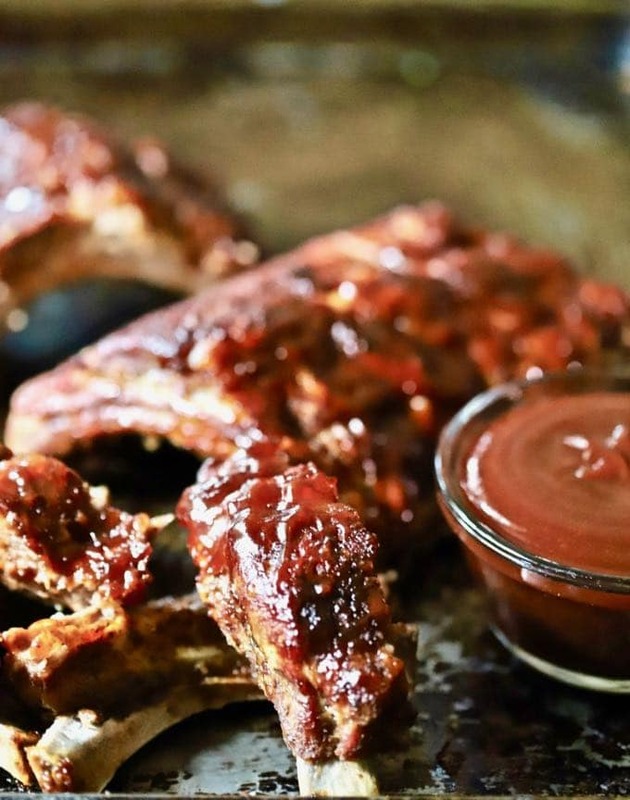 Place the ribs on a baking sheet with a rim. Put the ribs in the oven and cook for 1 1/2 hours. Or, until the meat starts pulling away from the bone and is tender. 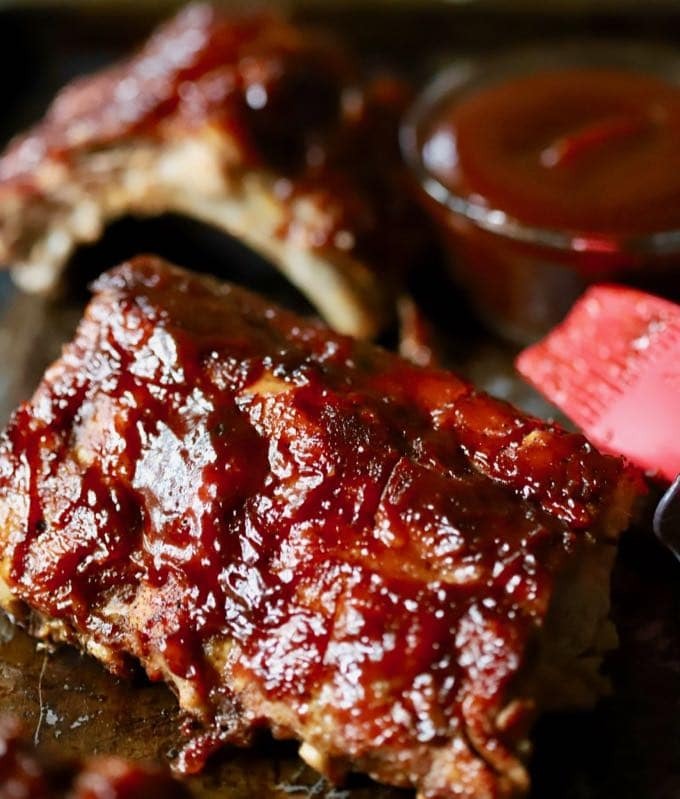 When the ribs are done, open the foil packet completely and brush on your favorite barbecue sauce. Turn up the heat to 350 degrees and let the ribs cook for an additional 30 minutes. Serve immediately with plenty of napkins! 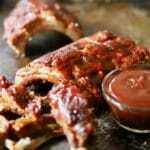 These easy Best Oven-Baked Baby Back Ribs are succulent, fall off the bone tender and when slathered with tangy barbecue sauce, just plain finger-lickin' good! A special baby back ribs dry rub enhances the flavor even more and these oven cooked baby back ribs are every bit as good as those cooked on the grill! Remove the membrane from the back of the ribs by using a small paring knife to pry up a corner of the membrane. Then grab the membrane with a paper towel and peel it off down the length of the ribs. 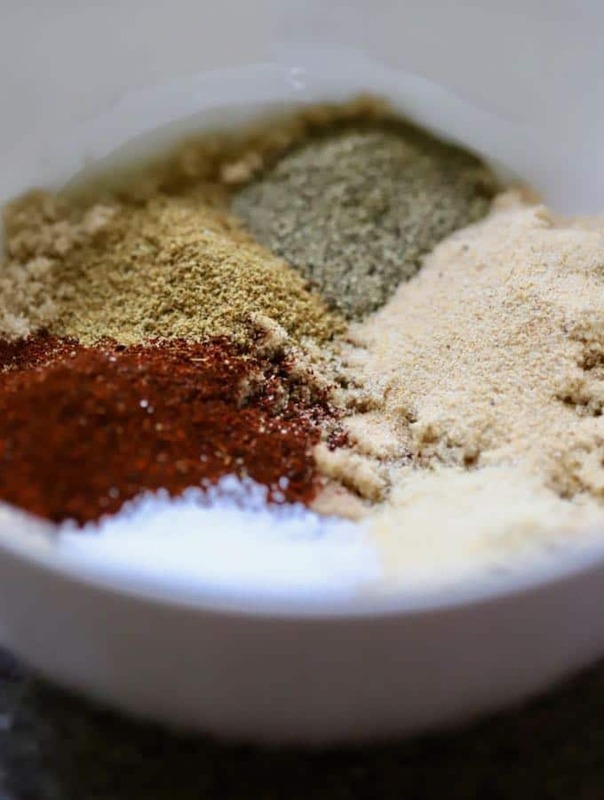 Combine all dry rub ingredients in a small bowl. Sprinkle the dry rub liberally over the front and back of the ribs and gently rub it in. For the best flavor, let the ribs sit with the rub on them for at least 30 minutes, or you can refrigerate them and let them sit for up to 24 hours. 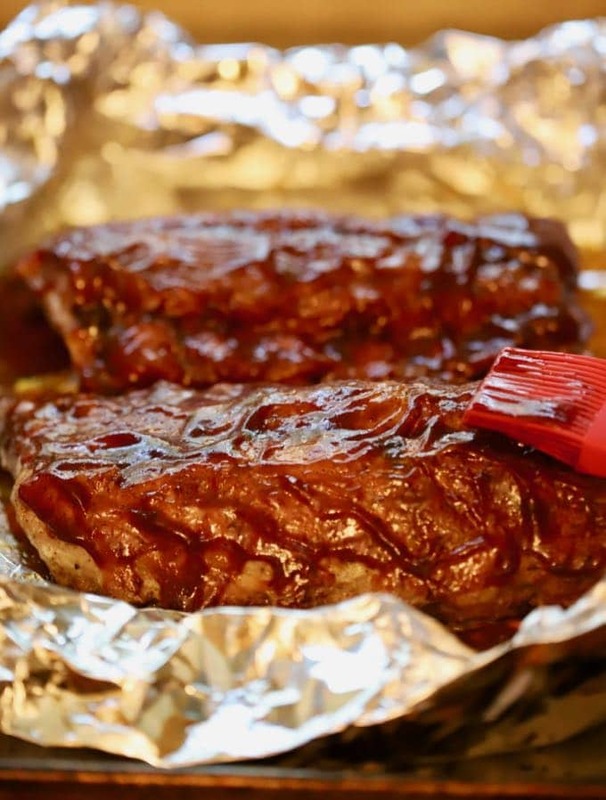 When ready to cook the ribs, wrap them in heavy duty aluminum foil and place them on a baking sheet with a rim. Place them in the oven and cook for 1 1/2 hours or until the meat starts pulling away from the bone and is tender. Thanks for the recipe! It came through in a pinch! It’d been awhile since my mom & I made some BBRs. So I googled it, and found this one. I didn’t have time to get the stuff for the rub, so I just used a store brand. It came out so tender and juicy! and it didn’t take 4+ hours! Thanks again for sharing this with us! 😄 Look forward to trying it with your rub next time! Thanks so much for your kind comment! I’m so glad you enjoyed the ribs! Looking forward to trying your recipe for baby back ribs. This is a first for me. I’ll let you know how they turn out. I hope you enjoy them! Be sure to let me know how they turn out! So meat side up or down? When cooking the ribs in the oven place the meat side up. I hope you enjoy them! I’ve been using this recipe for ages and always place it in the oven merry side up. Perfect every time! Oh my goodness! You have made my day! I am so glad you enjoyed the ribs! I made these tonight and they were great!! I actually had about 6 lbs of baby back ribs and they cooked up great with your times. I love that the dry rub is so simple and I already had the ingredients in my cupboard. My father-in-law is a big meat guy and he had seconds of these! Yum! Thank you! Hi Emily, I’m so glad your family enjoyed the ribs and thank you too for letting me know. You made my day! I’m so glad you enjoyed this recipe. Your solution to use molasses instead of brown sugar was genius and I’ll have to try that next time! Just made these ribs completely from the recipe. They are so juicy and delicious. I had a hard time waiting for them to cook! Amazing recipe. The dry rub was beyond good. I let my ribs sit with the dry rub for 1 1/2 hours and it was perfect. 10/10 ribs. Thanks you for the amazing and easy recipe! Hi Kendal, I’m so glad you liked the ribs! Thanks so much for sharing! You made my day! Baby back ribs are pork ribs. You should still be able to use this same recipe for beef ribs, but I would add at least 30 minutes and maybe 45 minutes to the cooking time because they will be larger. Before you unwrap them to put the barbecue sauce on, test them with a fork to make sure they are tender. The meat should be practically falling off the bones. Be sure to wrap them securely with foil and they will not burn at 300. And, no you don’t need to add any water to the pan. Good luck and let me know how they turn out. Hi. This is a great recipe! Thanks! Question: After brushing on my favorite BBQ sauce and turning the oven temperature up to 350 degrees, do I continue to bake for 30 minutes with the foil packet opened, or should I reseal it and bake with it closed? Hi Carl, Yes, leave the foil open. Hope you enjoy the ribs! Is it necessary to cook finish cooking without slathering on BBQ sauce? I apologize but I am not quite clear what your question is? If it’s “can you cook the ribs for the last 30 minutes without adding BBQ sauce?” the answer is yes. If you prefer your ribs with only a rub on them, you don’t have to add the sauce. If this wasn’t your question, please let me know and I will try my best to help you. Oh my goodness! Followed recipe exactly and the results were fantastic! I bought the Sweet Baby Ray’s sauce you recommened. Can’t wait for summer to come so I can try these on the grill. Thank you so much for publishing this recipe! i’ve never felt confident with cooking ribs in the oven, and now I know they’re going to come out great, every time…. Thank you so much for letting me know you enjoyed the ribs! You made my day! Hi, I’m trying these tonight, my son is coming for dinner and he LOVES baby back ribs. I had all the ingredients for rhe dry rub and they are sitting waiting to be put in the oven I’ll let uou know how they turn out! I saw this a bit late, but hope your son enjoyed the ribs! Let me know! Sorryf for those typos in my review! So I baked them for 3 hours while I was out for the afternoon, These ribs by far were the most delicious baby backs I have ever eaten. They truly fell off the bone. I usually eat 2 ribs but with these I ate 6! My husband and son loved them too! Try em you’ll love em!! Hi Nancy, I’m so glad you and your family enjoyed the ribs! And, thank you too for letting me know! Thank you so much for letting me know you enjoyed the ribs!